Arthur Junghans, son of company founder Erhard Junghans, was an early automobile enthusiast: in 1892 he bought one of the first Daimler test cars, which was personally driven to him in Schramberg by Wilhelm Maybach. A close friendship developed between the technically-minded Arthur Junghans, Wilhelm Maybach and Gottlieb Daimler. As a result, Schramberg regularly played host to the technical elite of the era, from Robert Bosch to Ferdinand von Zeppelin. These meetings held at Arthur Junghans' villa served to generate ideas, with these in turn producing numerous significant inventions. The new Meister Driver Day/Date models incorporate design elements of these classic cars in their appearance. The dial resembles a speedometer with large minute and hour markers. 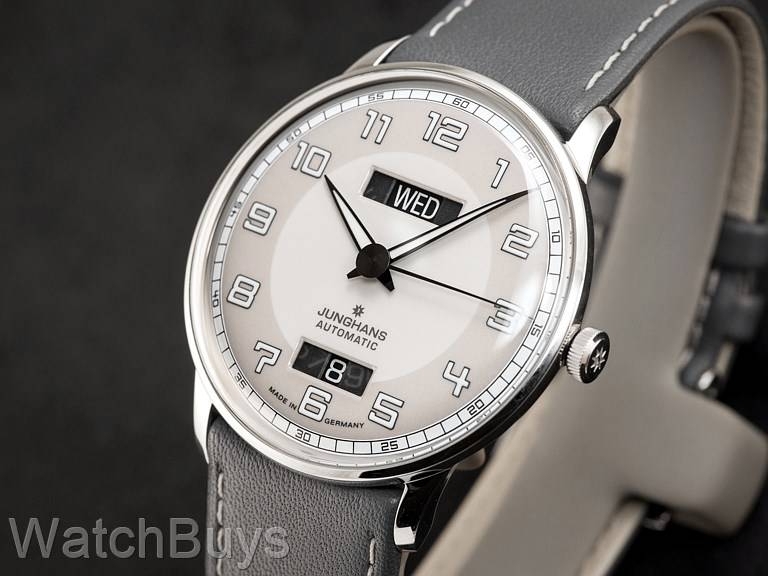 Oversized day and date windows can also be found at 12 and 6, lending supreme legibility to this striking new model. The Junghans calibre J800.4 (based on an ETA 2824-2) 'drives' the watch, and is beautifully finished with blued screws, perlage and Cotes de Geneve. As a "measuring stick of excellence", Junghans drew inspiration for this model from an extraordinary - and rare - classic car built in 1932, the Maybach DS 8 Zeppelin. The Maybach is so rare that only 25 exist worldwide. The discreetly-padded leather strap with contrast stitching also reflects the affinity to the car: not only do they incorporate the interior colors of the classic vehicle, the lining leather also features the typical perforations of the classic car seats. We love the silver and sand colored dial on this watch which is finished with lacquer. Next, the polished stainless steel case continues to add classic appeal. The watch is enclosed by a domed hardened plexiglass crystal with SICRALAN coating for added protection from scratches. This watch is water resistant to 30 meters and features a grey calf leather strap with perforated lining and tang buckle.